You’re invited to a Town Meeting on Wednesday, January 11th at 5:30pm at the ARTS Obispo office in the SLO Creamery (no, we haven’t moved yet!). We will be discussing POTENTIAL CHANGES to the 2012 Open Studios Art Tour that involve Encore Weekend and North County participants. If you’d like to hear the discussion and weigh in on these hot topics, please join us! Many see the Open Studios Art Tour as having a very particular goal: a way for artists to sell their work and for people to buy local art. I’d like to suggest that it’s much more than that in many cases and make an argument for considering OSAT as an important educational tool for both the artists of the next generation and for those who must be taught to “see” in order to appreciate art since so little art appreciation is taught in schools now. I want to give a personal thanks to the artists who I visited with my two grandchildren (7 and 10). Each artist shared his/her artistic process with the children, talked to them (and in some cases, fed them), and taught them something about the art they looked at, treated the children as if they had serious interest in what they were observing. Diana Bittleston walked the children around her garden to study some of her paintings (water colors/oils), explaining that each was her attempt to solve some sort of problem, the way light comes through a wave, an attempt to make sliced limes look as if we might pick one up to lick. Lynn Matheney showed them her especially whimsical figures, talked to them about what they meant to her, and even took little Kathryn into her “studio” to work on clay figures. Not only did she sit with her but Carol baked the figures, offering to let Kathyrn paint them! This in spite of a house-full of perspective buyers! Carol Silva Johnson (wood images) told the children about the animals she created and explained the colorful paint she used. (She also fed them). My grandson (10) got it; he said (with a hint of whimsy) that he wasn’t sure he should have any food set out on the table because it could be ART. Crissa Hewitt (silver/jewelry) showed them a flat piece of silver, explaining that her jewelry begins there: the origin of all her silver work. She talked to them about the process of molding and bending. 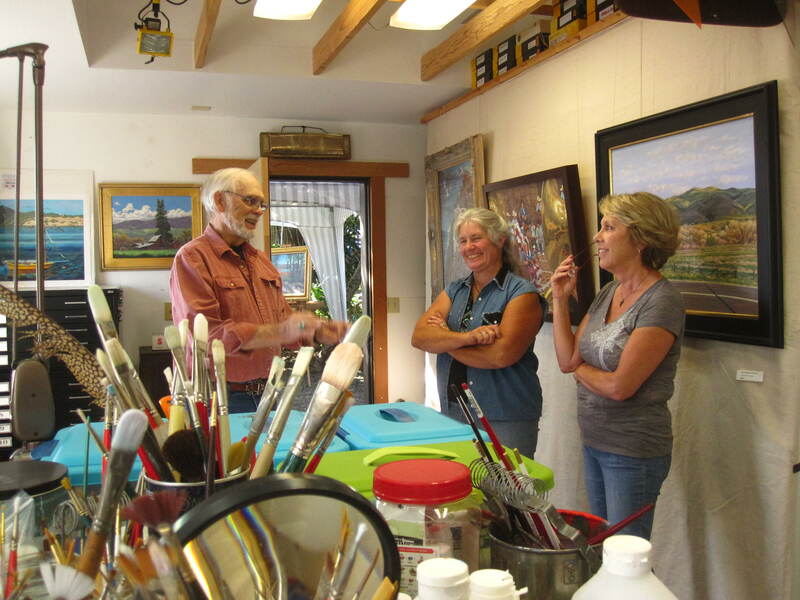 They looked around in awe at her studio filled with impressive machinery and tools. Ray Brooks had the children hold the gems he had found, cut, tossed and polished. He showed them the way the pieces glowed in the sunlight, the way they changed under a magnifying glass, and he explained where he found them and what he’s learned about geology. They both learned that the simple-looking everyday rock might be a treasure. We might forget that now, without charging for the catalogues, ARTS Obispo is encouraging families to bring their children on the tour, that it’s a fine way to educate the next generation. Thanks to those artists who were so generous with their time to talk to these children who chatted about their favorites all the way home.